Announcing X11 on the Pre! 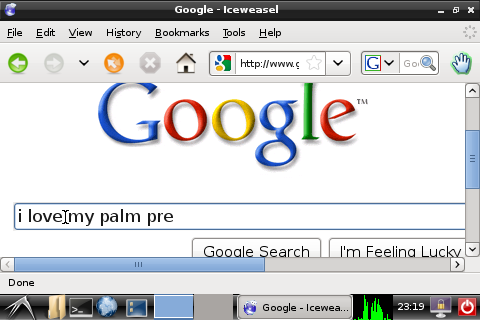 To summarize the main idea, this means you can now run native linux GUI applications on the Palm Pre! TL;DR--What does this look like? Additionally, phil_bw has made a video of OpenOffice running on the Pre! Awesome, so how do I get this on MY phone? This is all still in testing as we work how to bring this to you in the most convenient, flexible, and useful manner we can. Just a note to say that we do have a roadmap of being able to install native Debian X11 GUI applications (like OpenOffice) via Preware. But don't hold your breath, cause it looks like we need to write a whole new FUSE filesystem driver to be able to do it. Think weeks to months, rather than days. As a side note, both the X-server, as well as xterm (Terminal that runs on X) are available in the Preware Testing feed for your... testing . Who did all this amazing work? Who do I thank? In short, the hard work of everyone at WebOS-Internals. X Server, xterm -- dtzWill (Will Dietz, me!) Also shivaramv (Shivaram Venkataraman), and Jacques from WebOSInternals. 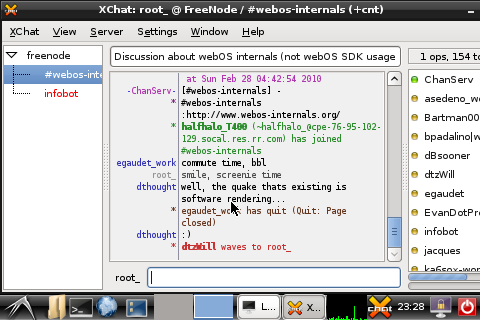 Debian Chroot work -- WebOS Internals. ...and many other people. Shoulders of giants, etc . Feel free to subscribe to this thread as we'll post updates as we make progress! If you like my work, please consider donating or buying VBA! tlaz and xandros9 like this. Wow awesome job guys, I'm always shocked at what you guys can do. I'm Phil (phil_bw), the man with the camera and OpenOffice.org running on my Pre. I just want to clarify a few things myself. First of all: although I took the video I probably did the least amount of hard work here. Please give nearly all credit to dtzWill and the other WebOS Internals people. Second: to reiterate what Will said, this is all still in *testing*. Although this could be setup relatively easily for someone native to Linux, the common man would probably have some trouble. I have been working to really modify the fvwm window manger to make it far more mobile friendly. In the video you see pieces of their default theme which looks just like Windows 95. I am in the process of removing any and all traces of Windows 95 that I can. I plan on making the buttons/scroll bars bigger, add hot keys to easily switch from virtual desktop to virtual desktop, and even incorporate some on screen gestures (since apparently they are available in fvwm). I have *very* little time to devote to extra projects like this so don't expect anything on my end over night. Heck I'm still trying to get my first commercial WebOS app out the door (that's been a long road in itself). Finally I will say one last time: This isn't easy to setup for a beginner. But since I know many will ask how to do it. Here is the basics you need to know. OMG,This is going to be huge, yous internalz guys always think of everything. Last edited by Menace187; 04/09/2010 at 11:39 PM. A *nix box running openssh and with X11 applications already installed and the openssh daemon configured to allow X forwarding. 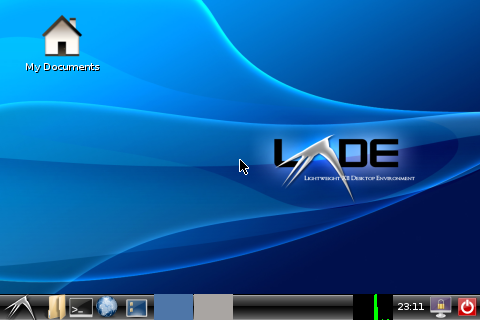 install "Xterm" from the Preware Alpha feed. This will install the needed packages for the Xserver on your Palm device. now you are going to ssh to your local *nix box. I suggest you run a command like the following "ssh -X user@192.168.1.1" (again without the quotes, where 'user' should be replaced by your username and '192.168.1.1' should be replaced by your *nix box's IP or hostname.) Enter the password when prompted. You will now be in the shell of your remote machine where you should be able to enter a command to start the remote X11 application. Try "xterm" for example. Running a command to start an actual window manager or desktop environment would probably be best for step 6, but it depends on what you have installed on your *nix box. I would suggest installing xfce4 to your *nix machine and running "xfce4-session" - that has been working great for me. If you already have GNOME installed try running "gnome-session" - unfortunately this crashes after not long for me. This post is a great example of how developers can access all this framework technology that WebOS Internals is slowly making available to everyone via Preware, and come up with new use cases that we haven't even thought of. Thanks for your interest. This presents a serious question. Should the developers here spend many hours creating a tutorial, and then spend many more hours supporting people trying to use that tutorial, and then spend many more hours helping people who didn't read the tutorial properly fix their mistakes? Should the developers focus on getting this into a state where it can simply be installed from Preware? I personally think there are many experienced people in the community who are not the developers working directly on getting this stuff to work in the first place, but have enough knowledge, skills and experience to understand how it all works, and have the inclination and community spirit to write the tutorial and support other users. I would like to see other people step up to the plate and do their part for the community in this way, rather than take time away from dtzWill and phil_bw (and others) creating the underlying technologies that are being used here. Last edited by rwhitby; 04/09/2010 at 06:48 AM. I know what i'll be doing when I get home from work tonight. Thatnk you for all youur work webOS Internals! You guys continue to amaze! awesome, thanks for the hard work! The heck with Leveno, HTC, RIM and the rest, WebOS-Internals needs to buy Palm!!! wow...speechless. this is amazing! but could i pose a practical question....will this void my warranty? Wow, this is a big deal! I can't wait to see all the apps that are suddenly available! Will Skype be possible? don't understand why you guys think a whole new FUSE file system would have to be written? I assume its because you want to store the linux environment needed for X on the fat formatted file system? you do realize this problem has been solved many times in the past? (i.e. going way back, there was umsdos (FAT filesystem and Linux - Wikipedia, the free encyclopedia), but even today I think there are solutions to make it work). just want to say great work once again and i have to say i nearly ****ed myself when u said webos internals should buy palm. the idea is funny yet so true. looks like there going to need a lot more donations. 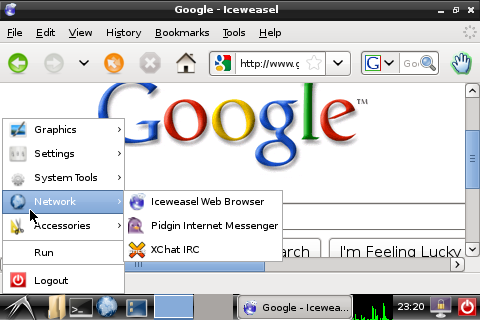 Is it possible to repackage some of these linux programs with settings optimized for display on smaller screened devices? While this is an effing awesome development, having scroll so much in apps like openoffice is a bit of an annoyance. Well, I got all excited and started to install debian chroot. But on trying to download the debsmall.img.bz2, bunzip reported that the file was corrupt. Tried redownloading and tried finding another source, but same result on download and no hits on another source. Any other documented paths for this? NEVERMIND: The third download time was the charm.